Madame Tussauds, Legoland Windsor, Legoland Manchester, Warwick Castle, Chessington World of Adventures, the Dungeons (Edinburgh, Blackpool, York & London), Thorpe Park, London Eye (only until 31st May 2013), Alton Towers, Sealife centres & sanctuaries, Dublin Zoo, Blackpool Tower and National Aquatic Centre. Let the FREE fun begin… all you have to do is decide who to take with you. Voucher valid until 31.05.13 at the EDF Energy London Eye and 31.07.2014 at all other participating attractions. Must be accompanied by a separate full paying child or adult. 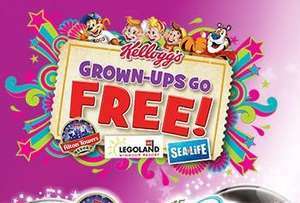 This has been posted a few times, as the vouchers are on lots of Kellogg's cereals, and has been on for a good few weeks. Not sure if a 'duplicate' post as such, because I can't specifically recall the cereal bar/ co-op post. I have at least a dozen vouchers now, and will give most of them away to family & friends. I get to go to Alton Towers twice a year for free with the school (a little perk for looking after 200-250 kids from 5 in the morning until just before midnight).